The main aim of our projects is the development of novel, efficient and reliable catalytic asymmetric methodology – our current aims encompass the design, preparation and application of new catalytic systems. A modular design of the catalysts, the versatility of the synthetic strategies and the computational analysis of the catalytic event are key factors in our strategy. This project entails the development of strategies to generate enantioselective supramolecular catalysts that incorporate regulation mechanisms for the catalytic site. The backbone of these catalystsis based on a privileged structure from asymmetric catalysis that also contains a regulation center. The regulation mechanism is triggered by a regulating agent (RA) that interacts with the ligand via supramolecular interactions to create a particular catalytic system that retains the majority of the backbone’s structural features, while incorporating peculiarities in the geometry of its active site that depend on the RA used. Optimizing a catalyst normally requires the preparation of libraries of ligands (or catalytic systems). Thus, our strategy is advantageous in that it enables facile preparation of ligand libraries by exploiting the interactions between an enantiopure ligand and a set of structurally diverse RAs. We have already reported the design and preparation of supramolecular bisphosphine and bisphosphites ligands with a distal regulation site and their application in rhodium-mediated asymmetric hydrogenations, hydroformylations and palladium-mediated allylic substitutions. In the most efficient supramolecularly regulated ligands for hydroformylations and hydrogenations, the two phosphorus ligating groups are separated by a polyether spacer, of varying length and topology, that serves as the “regulation” site of catalytic activity. Complexation of the regulating agent to the polyether chain brings the two phosphorus ligating groups close together (this is the template effect promoted by the RA), thus facilitating the formation of a chelate in the presence of the corresponding metal precursor for hydroformylations or hydrogenations. Furthermore, the RA also induces the catalytic site to adopt a particular geometry, depending on its size and shape (this is the regulation effect on the supramolecular complex to be used as an enantioselective catalyst). The induced changes in the geometry of the catalyst for hydroformylation accelerate the reaction rate and increase the enantioselectivity in the reactions of a set of alkenes. 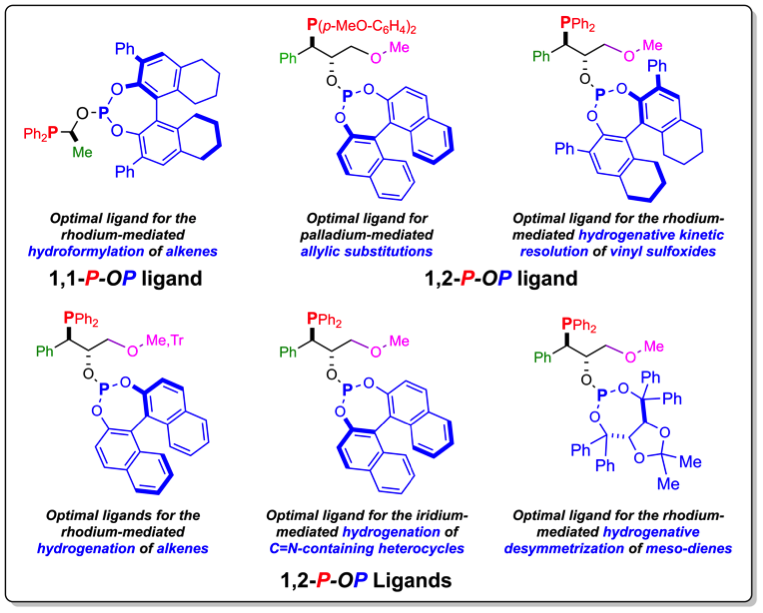 Given that we have demonstrated the feasibility of our regulation approach in asymmetric catalysis, we are now endeavoring to prepare a set of ligands that incorporate a wider range of functional groups for asymmetric catalysis (e.g. phosphite [already studied], phosphine, oxazoline and N-heterocycles carbene groups), a wider range of regulation centers and an array of structurally more diverse RAs (e.g. Group I [already studied], II and III metal salts; ammonium salts; and phosphonium salts). It should be noted at this point that introduction of new stereogenic elements into the regulation center, and/or use of enantiomerically pure RAs, might afford a more efficient regulation mechanism for the enantioselectivity of the final products. We will endeavor to expand the scope of the catalysts derived from the supramolecularly regulated ligands to include the catalytic asymmetric synthesis of precursors of pharmaceutically or agrochemically active ingredients, and/or other biologically active compounds. We will also evaluate these new supramolecularly regulated ligands in highly interesting transformations for which enantioselective catalysis solutions are presently needed, including hydroformylation, and cycloaddition reactions and other applications. For an overview and future perspectives on supramolecular (enantioselective) catalysts, see: Chem. Soc. Rev. 2014, 43, 1660; Chem. Soc. Rev. 2014, 43, 1734. Rhodium-based supramolecularly regulated catalysts for asymmetric hydrogenations, see: Adv. Catal. 2011, 54, 63; Org. Lett. 2011, 13, 3632; Tetrahedron 2015, 71, 4490; Chem. Eur. J. 2015, 21, 11417. For the asymmetric hydroformylations of functionalized alkenes and other challenging substrates, see: Chem. Eur. J. 2013, 19, 2720; Chem. Eur. J. 2015, 21, 11417; J. Org. Chem. 2015, 80, 10397, and other manuscripts in preparation. Palladium-based supramolecularly regulated catalysts for asymmetric allylic substitutions, see: Organometallics 2016, 35, 528. The project deals with the design and synthesis of highly modular enantiopure phosphine-phosphite (P–OP) ligands for a priori use in various asymmetric transformations. The performance of the catalysts derived from these ligands can be tuned via modification of the characteristic parameters of each module (i.e. the electronic and steric properties of each molecular fragment). This is a sound approach based on proven principles: that catalysts can be made more active by modifying the ligand modules according to relevant molecular interactions and computational studies. To date, these P–OP ligands have been applied to rhodium– and iridium-mediated asymmetric hydrogenations, rhodium-mediated asymmetric hydroformylations and palladium-mediated allylic substitution reactions. Interestingly, highly efficient catalytic systems for new hydrogenative transformations (i.e. kinetic resolution of vinyl sulfoxides by hydrogenation and desymmetrization of meso non-conjugated dienes) employing rhodium-complexes derived from our P–OP ligands have been developed. Following this precedent, we will endeavor to expand the scope of the catalysts derived from the P–OP ligands to include the catalytic asymmetric synthesis of precursors of pharmaceutically or agrochemically active ingredients, and/or other biologically active compounds, based on the above mentioned transformations. 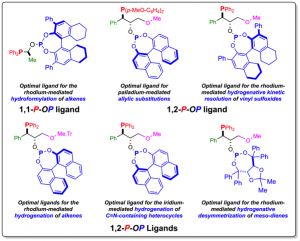 We will also evaluate new P–OP ligands, and those that we have already prepared, in highly interesting transformations for which enantioselective catalysis solutions are presently needed, including cycloaddition reactions and other interesting transformations. For an overview of P-OP ligands, and their potential in asymmetric catalysis and future perspectives, see: Chem. Rev. 2011, 111, 2119. For the [Rh(P-OP)]+-mediated hydrogenative transformations of functionalized and other unprecedented substrates, see: Adv. Synth. Catal. 2008, 350, 1984; Chem. Eur. J. 2010, 16, 6495; Chem. Eur. J. 2011, 17, 13978 (cover page); Organometallics 2011, 30, 6718; Chem. Rev. 2011, 111, 2119 (highly cited paper); Adv. Synth. Catal. 2012, 354, 3025; Chem. Soc. Rev. 2013, 42, 728 (highly cited paper); Chem. Commun. 2013, 49, 10666 (inside cover and hot paper); Org. Lett. 2013, 15, 3634; Organometallics 2014, 33, 2960; Chem. Eur. J. 2014, 20, 15375 (inside cover); RSC Adv. 2014, 4, 58440; Org. Lett. 2015, 17, 4114; Synthesis 2016, DOI: 10.1055/s-0035-1561360 and other manuscripts in preparation. For the asymmetric hydrogenations of nitrogenated heterocycles mediated by [Ir(Cl)(P-OP)], see: Organometallics 2010, 29, 6627; Org. Lett. 2013, 15, 2066; Green Chem. 2014, 16, 1153; Eur. J. Org. Chem. 2015, 36, 5293 (cover page); and other manuscripts in preparation. For asymmetric hydroformylations of alkenes mediated by [Rh(H)(CO)2(P-OP)] complexes, see: Org. Lett. 2013, 15, 3634; Chem. Eur. J. 2014, 20, 15375 (inside cover); Organometallics 2014, 33, 2960; and other manuscripts in preparation. For the palladium-mediated asymmetric allylic substitutions, see: Tetrahedron: Asymmetry 2010, 21, 2281. For previous contributions in this field, see: Chem. Eur. J. 2011, 17, 13978 (cover page); and other manuscripts in preparation. Catalysis is arguably the most important factor in the sustainable and efficient use of raw materials, which is ever more important to modern society. Catalysis is pivotal to the development of new processes characterised by low energy consumption, atom economy and very low environmental impact. Over 80% of commercial chemical processes in the bulk chemical and polymer industries fields imply catalysis. These processes require efficient catalytic systems that satisfy the economical constraints of each product. Catalysis is a well-established discipline which has facilitated the production of huge amounts of myriad chemical products by making production efficient, robust and economically and technologically feasible. Nonetheless, industry still demands improvement and innovation in catalysis, especially in the areas of catalyst activity and selectivity, sustainability, energy consumption, waste minimisation, and environmental protection. In response to ICIQ’s aspiration of fostering collaborative research projects with industrial partners, I have established collaborations with strictly defined objectives. In conjunction with Medichem S.A., we have developed efficient synthetic routes for active pharmaceutical ingredients and the outcomes of this work have been filed as a patent. In conjunction with Bayer MaterialScience (lately Covestro), my group is involved in developing new and patent-free catalytic systems that efficiently mediate the alkoxy-carbonylation of anilines. Since the beginning of the cooperation in 2006, a number of patents have been filed and several articles have been published. WO/2010/105768; EP/2010/2230228; KR/2011/0139219; IN/2011/DN07101; JP/2012/520333; US/2012/041223; CN/2012/102356062; US/2013/8513453; EP/2013/13168788; JP/2014/5645911; WO/2014/187756; EP/2014/187756; EP/2015/2408737; CN/2016/105229015; KR/2016/009565. Eng. Chem. Res. 2010, 49, 6362; Ind. Eng. Chem. Res. 2012, 51, 16165.